HERE WE GO! 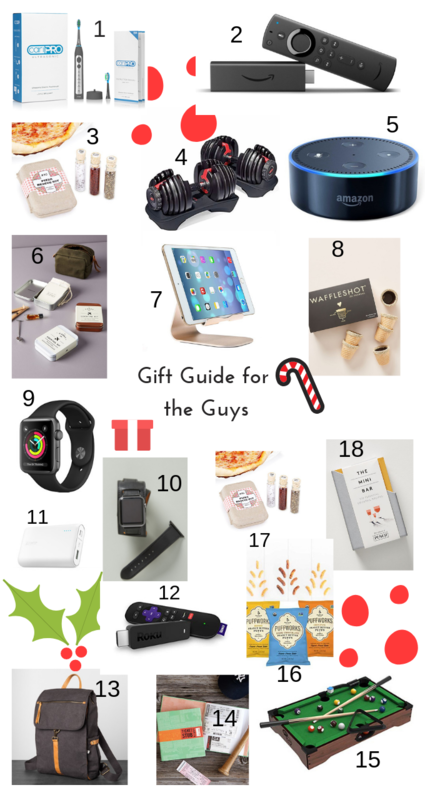 A gift guide for all the men in your life! Amazon FireStick – Although I do not personally own one of these, I know so many people who do and LOVE them! Pizza Rescue Kit – This is too cute! It comes with a few key pizza toppings to take with you when you’re going, well, any place but NYC 😉 Would be a great stocking stuffer, or a cute gift bag of someone who has just been to NYC recently or is from the City and will be traveling. BowFlex Adjustable DumbBells – I bought this weight set for my Husband last year and it’s probably his most used gift, aside from any videos games I’ve gotten him! This set goes up to 52.5lbs. and is SO perfect for apartment living or if you don’t have a lot of room in your workout room. They’re super easy to use, all you do is turn the dial on each side of each weight to bring up just the amount you need. They adjust from 5lbs. all the way up to 52.5lbs. You can see a demo of the weights on my instagram in the “Cyber Week” highlights reel! HIGHLY RECOMMEND! Amazon Echo Dot – Ahhh, Alexa. Thanks for always answering our questions! I bought us an Alexa during Prime Day in August and we use her every day. 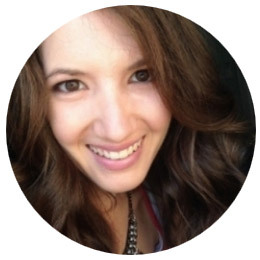 She’s our weather girl, DJ, timer, hands free google, and so much more! I know multiple Alexas can talk to each other, but we live in a one-bedroom, so we just yell. Carry On Cocktail Kit – On the pricy side, but super cute for the traveler who loves a good cocktail. This kit comes with 3 kits, and all the fixin’s to make 2 Moscow Mules, 2 Gin+Tonics, and 2 Old Fashioneds. So you’re really getting 6 drinks on the go! Would be cute for newly weds for their honey moon! Tablet Stand – My Husband loves this stand for his iPad! I demoed this one on stories as well, so you can see it in my highlights reel. It’s really cool tho, and a great gift for anyone! WaffleShot Cones – If you know a guy, or anyone for that matter, whose birthday is near Christmas, this would be a GREAT gift! Fill the cones with any liquor, or even chocolate milk for the kiddies, and bottoms up! Apple Watch – I love using this to track my activity! It’s also super helpful that I don’t have to always have my phone on me! Apple Watch Band – This watch band is SO cool! My husband has a cuff that looks similar to this, so when I saw this I had to include it in the gift guide! It’s the perfect way to make your Apple Watch look less sporty, and more casual/dressy. Anker Portable Charger – I LOVE THIS THING! I’ve charged my phone 5x and I have yet to recharge the case itself. Seriously it’s that good! Put this in your kids backpack for school, or your husbands briefcase for work, so they’ll never go without a charge! HIGHLY RECOMMEND! Roku Streaming Stick – Another thing that I don’t own, that I’ve heard SO much about! Hearth & Home Laptop Backpack – Another idea that my Husband has and loves! He recently got a job in a more casual environment, and brings this everyday to work! He carries a laptop back and forth and it fits that and everything else he needs with ease! He’s 6’4″ and it doesn’t look too small on him! Ticket Stub Diary – How cute would this be for any sports / music fan!? It would also be a great way to give tickets to something, just stick the tickets in one of the pages and watch their reaction when they open it! Perfect for any age! Mini Tabletop Pool Set – Yet another gift idea my husband already has! He loves to play pool, so I bought this for him a few months ago. We keep it on the coffee table and he shoots a few rounds while were watching TV or chilling on the couch. It’s also a great conversation starter. Great for a guy that maybe just moved out on his own- don’t want to get coffee table books, games are a great idea! PuffWorks PeanutButter Puffs – These things are SO good! Great if you know anyone who loves peanut butter! This particular variety pack comes with an original peanut butter flavor, a honey roasted flavor, and a dark chocolate flavor- all peanut butter based. SO good! The Mini Bar – This is a book of drink recipes. Perfect for the bachelor or any who likes to drink. Again, I got my husband a similar book a few years ago and he likes to use it when we have friends over! I hope this was helpful! Let me know what gift guide you would like to see next! 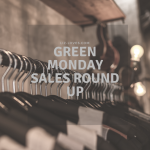 Previous Post Cyber Sales Round Up!